Over 500,000 high altitude weather balloons are launched across the globe each year. Most are for government meteorological or research purposes, but over 3,000 amateur and educational flights are also conducted every year around the world. Although high altitude weather balloon launches can provide valuable results, care must be taken to abide by the governing laws and regulations to ensure weather balloon safety for aircraft and those that may be impacted by the launch and landing. Below are [our interpretations of] the applicable laws and regulations that apply to high altitude balloon flights in the United States. Any on-board cellular (phone) tracking systems must be turned off (Airplane mode enabled) as it leaves the ground. Any individual payload box/package must weigh less than 6 pounds. If a payload package has a weight-to-size ratio of more than 3.0 ounces per square inch it must weigh less than 4 lbs. Calculation = Total payload package weight in ounces divided by the area of its smallest face in inches. Flights with multiple payload packages carried by one balloon must weigh less than 12 pounds in combined total. The string used to suspend the payload package(s) from the balloon must be able to separate/terminate with an impact force of no more than 50 pounds. No person may design or intentionally operate any unmanned free balloon in a manner that creates a hazard to other persons or their property. As long as the above criteria in #2-5 above are met, no prior notifications to the FAA are required; however, we always issue multiple NOTAMs (Notice to Airmen) via the FAA’s Federal NOTAM System and also file an official HiBal Pre-Launch Notice by contacting the FAA’s Tactical Operations Support Group, the FAA’s Rochester NY Flight Standards District Office (FSDO) and Air Route Traffic Control Center, Cleveland Center (ZOB) within 6-24 hours prior to our launch. We notify them of: Intended launch date/time, launch location, estimated time & flight path to burst altitude or 60,000 feet (whichever is lower), expected duration of flight, estimated location of impact, expected rate of ascent (ROA), size and color of the balloon and weight/length/size/color of payload and parachute. We also provide a copy of our expected flight path map and the live tracking URL for detailed positioning expectations and in-flight positioning reports. Our balloon envelope is equipped with a radar reflective device that will present an echo to surface radar operating in the 200 MHz to 2700 MHz frequency range. We do not typically operate before sunrise or after sunset. If we do, we include high visibility strobe lights on our payload(s). We do not use a trailing antenna. Our suspension system is limited to 50 feet long at most. We do not fly under 5,000 FT. within Class B, C, or D airspace. A draft HiBal Pre-Launch notice is filed with the FAA’s “Tactical Operations Support Group”, usually weeks in advance. Multiple Notice to Airmen (NOTAMs) are filed and published between 6 and 24 hours prior to our flight. Nearest major & minor airports to the predicted landing zone. 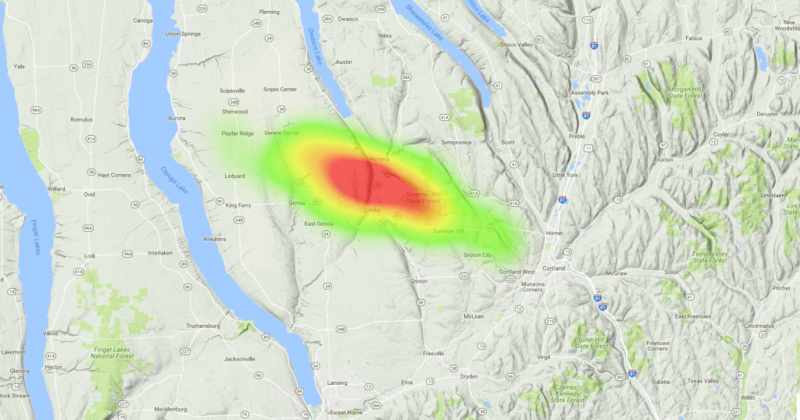 This is frequently, but not limited to: Syracuse (SYR), Cortland (N03), Penn Yan (PEO), Finger Lakes (0G7), Skaneateles (6B9), Whitfords (B16), Williamson-Sodus (SDC), Elmira (ELM) among others as necessary. We notify the Rochester TRACON and Cleveland ARTCC 15 minutes prior to launch, as requested. We forward the exact launch time to the Cleveland ARTCC, as requested. We monitor the course of the balloon and record its position throughout the flight. We forward automatic positioning reports to the Cleveland ARTCC, as requested. If a balloon position is lost or not reported after 30 minutes, notification is immediately provided to the Cleveland ARTCC, as requested. We forward exact burst time to the Cleveland ARTCC, as requested. We notify the Cleveland ARTCC when the flight has ended, as requested. Prior to launch, we typically run between 1,000 and 4,000 flight predictions in the week leading up to the launch, depending on the consistency of the predictions throughout the week based on the Global Forecast System (GFS). These predictions are usually facilitated via the CUSF Predictor or the AstraPlanner Predictor. These flight predictions give us a very good picture of the wind pattern and forecast trends as they change and become more accurate as launch day approaches. This also gives us a large landing zone coverage area and a margin of uncertainty that we can work with and use to evaluate all possible landing areas. Our flights will only launch if the entire landing zone coverage area, including the margin of uncertainty (usually about a 15 mile radius), is outside of and away from major cities, airports, hazards and large bodies of water. A copy of our flight landing zone and flight path expectation maps are also provided to the FAA organizations above 6 to 24 hours prior to launch. Our flights utilize an inline parachute system which is a fail safe system that ensures that the parachute will open once the balloon has burst. It’s important to calculate the parachute’s performance capabilities using the manufacturer’s specifications. Typically, we shoot for a landing speed of approximately 5 m/s or 11 mph. This ensures that the payload package will reach the ground quickly to prevent too much downwind drifting, but also ensures that the styrofoam payload box will land softly enough to not cause damage to any persons or property on the ground. We typically use Rocketman Parachutes in either the 4 ft. size model or the 5 ft. size model. This is the appropriate size recommended by the manufacturer to achieve our target landing speeds. As an additional safety precaution, we also add audible landing alarms to the outside of our payload box that sound just prior to landing to alert any persons (or animals) on the ground of the impending landing. This also conveniently serves as an audible locator beacon for us after landing for our recovery operations. Note: This page is completely the opinion of the author(s) and should not be taken as official legal guidance. Always research yourself to ensure you comply with the most recent laws and regulations, and whenever in doubt, ask! See our other frequently asked questions here.